Piano Quintet in C major, Op posth. 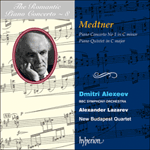 The Piano Quintet has a very special place among Medtner’s works. The composer himself regarded it as the synthesis or summary of all his work and, indeed, worked on it throughout his life. The first sketches date back to 1903/4 and it was only completed in 1949. This work, which was destined to be his last, combines freshness of inspiration with great mastery of composition. Again, the structure of the Quintet is unusual. The first movement expresses what can only be described as a theme of Hope and Faith. It opens with a large introduction in which the epic theme flows broadly and solemnly. The new subject in the central section reminds one of the famous medieval tune Dies irae. The next and final part, the Maestoso, is essential to the whole being of the Quintet: here the composer introduces a motif which has deep autobiographical meaning. It is written as if to the words of the Gospel passage ‘Blessed are you who are hungry now; you will have your fill. Blessed are you who weep now; you will laugh for joy’. A coda combines the two themes ‘Dies irae’ and ‘Blessed’ in a manner reminiscent of bells. The melody of the second movement is as beautiful and tragic as the words of the Psalm to which it was written (‘For your name’s sake, O Lord, you will pardon my guilt, great as it is’, and ‘Look toward me and have pity on me, for I am alone and afflicted’) and is deeply rooted in the ancient music of the Russian Orthodox Church. Gradually, the musical material in which fragments of the first movement can once more be heard flows into the ‘Blessed’ leitmotif, now sharply harmonized and distorted. The Finale, following attacca, is the synthesis which sums up elements of the whole work; it lasts as long as the first two movements together, and is written in extremely complicated sonata form. The main conflict can be seen in the contrasts not only between the first and second subjects, but also between the exposition and development sections, which turn into a battlefield of multiple polyphonic combinations. The coda revives the second theme which the composer himself called ‘the Hymn’: this is an amazingly simple melody, full of light and rejoicing.